Come learn about the Riverside Community Time Exchange! For more info, visit the group's website. August 1935 Ground is broken for a new high school in Riverside; thousands attend a sunrise groundbreaking ceremony. 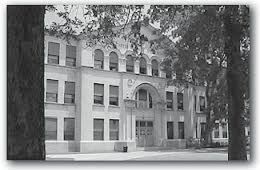 September 15, 1936 Riverside High School opens its doors to senior high and junior high students. The school mascot, the Eagle, is chosen to honor the Eagle family who were influential in Riverside education for many years—from Dr. Daniel Eagle, who built the first one-room Riverside school in 1876, to his grandson George Eagle, school board member who led the crusade to build a high school in Riverside. January 28, 1937 Sixteen mid-term graduates receive the first diplomas from Riverside High School. Did you know that the academic level only went to the eleventh grade back in those days? February 1941 The school board changes the name of the school to Amon Carter-Riverside High School in honor of the Fort Worth civic leader. Students and community members protest at first, but the change is eventually accepted. 1948 The school holds its first Homecoming; the Ex-Student's Association is organized. 1950 Riverside Junior High School opens for grades 7 through 9, relieving overcrowding at Amon Carter-Riverside High School. 1951 Spring commencement exercises include the Star-Telegram Publisher Mr. Amon G. Carter Sr., who is supposed to have received an honorary diploma. Mr. Carter never finished school, but he was instrumental in establishing Texas Tech University. Mid-1950s The Band Hall and Shop Wing are built, as well as the Athletic Field House. Fall 1958 CRHS reaches the state quarterfinals in football. 1959 Carter finishes second in the state 4A track meet and reaches the state semifinals in football. 1970 CRHS baseball makes it to the state semifinals. 1974 The school graduates 211 students, its largest-ever class. 1980 A new gymnasium is built. 1981 The school receives air conditioning. 1982 The auditorium painting Sacred Birds, a gift to Carter-Riverside from Amon G. Carter, is sold for over $50,000, and the proceeds are used to establish a scholarship fund. 1983 The school board announces plans to close Carter-Riverside, but the community rallies and unites to keep the school open. A historical marker is placed on the front lawn of the school. 1986 The high school's 50th anniversary celebration draws hundreds. 1989 A new northwest wing is built. 1995 Carter-Riverside makes a return to the state playoffs in football. Summer 1996 All 50's Reunion festivities draw over 700 former graduates back to the campus. 2001 The high school band increases to over 100 marching members, and the reinstituted ROTC program enrolls 130 students. 2011 Carter-Riverside celebrates its 75th anniversary. Visit the Amon Carter-Riverside High School website for more info! A little belated...but here's wishing the best to you and your families, from your neighbors and friends in the Oakhurst Neighborhood Association. May your 2013 be a memorable, successful, and enjoyable one!